Workflow management systems (WFMSs) are systems that generate, coordinate and monitor tasks performed by human workers in collaboration with automated (information) systems. 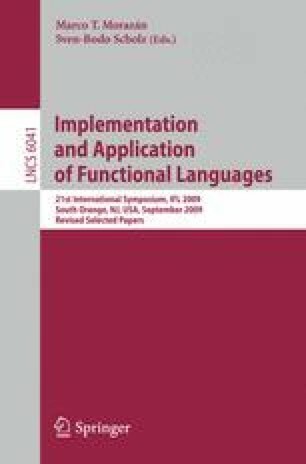 The iTask system (iTask) is a WFMS that uses a combinator language embedded in the pure and lazy functional language Clean for the specification of highly dynamic workflows. iTask workflow specifications are declarative in the sense that they only specify (business) processes and the types of data involved. They abstract from user interface and storage issues, which are handled generically by the workflow engine. Earlier work has focused on the development of the iTask combinator language. The workflow language was implemented as an engine that evaluated task combinator expressions and generated interactive web pages. Although suitable for its original purpose, this architecture has proven to be less so for generating practically usable workflow support systems. In this paper we present a new implementation of the iTask system that implements the combinator library using a service based architecture that exposes the workflow and a user friendly Ajax client. Because user interface issues are outside the scope of workflow specifications, and cannot be specified explicitly, it is crucial that the generic operationalization of the declarative interaction primitives is of adequate quality. We explain the novel generic libraries we have developed for this purpose.